The idea of fossil gas as a “bridge” from coal to renewables has been strongly promoted by the industry over recent years, and echoed also by government leaders including former U.S. President Barack Obama and EU Energy Commissioner Miguel Arias Cañete. 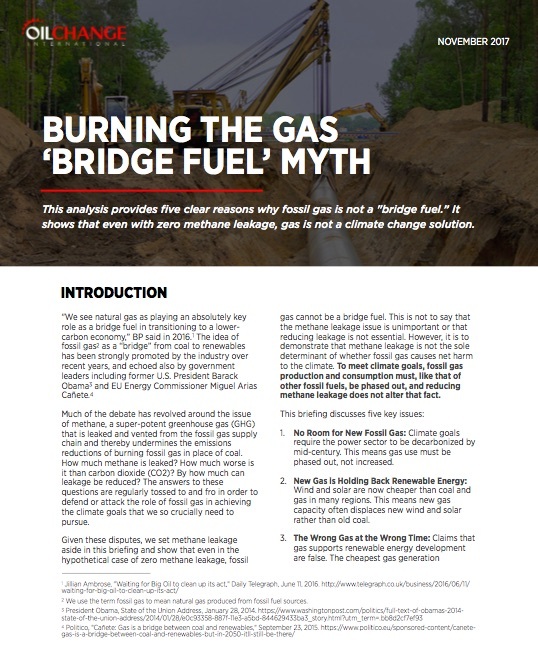 In this briefing we show that even in the hypothetical case of zero methane leakage, fossil gas cannot be a bridge fuel. This is not to say that the methane leakage issue is unimportant or that reducing leakage is not essential. However, it is to demonstrate that methane leakage is not the sole determinant of whether fossil gas causes net harm to the climate. To meet climate goals, fossil gas production and consumption must, like that of other fossil fuels, be phased out, and reducing methane leakage does not alter that fact. If methane that is extracted via fracking is a “bridge fuel” until renewable energy is ready and is necessary for our “energy independence,” in the US, why are they trying to export it by building more LNG (liquid natural gas) export facilities and more pipelines? This fracked gas, leaks alone the way, when burned adds to climate change, and contains radioactive radon. The water used to extract this gas is totally destroyed and can never be reclaimed. There is no safe way to treat or store this used fracking fluid. This “well brine” in PA in the US can be declared as having “beneficial use,” and then sold or given to municipalities to spread on highways for snow and ice or dust control. Renewable energy is ready now. We have the technology and natural resources to power the world without fossil fuel. Go to thesolutionsproject.org. All we lack is the political will. Extracting fossil fuel via fracking or mining is too dangerous, too expensive and totally unnecessary for our energy needs. The only thing stopping the transition to renewable energy are the profit addicted, dirty fossil fuel companies and the politicians at all levels of government who have been bought and owned by them. Contrary to their lies, we will not “starve and freeze in the dark” nor “wreck our economy” by transitioning to renewable energy now. Just look at Germany. you might be interested in this…2 hour blogcast…the topic? LNG..The title? LNG a bridge fuel too far. this is critial work. thank you..